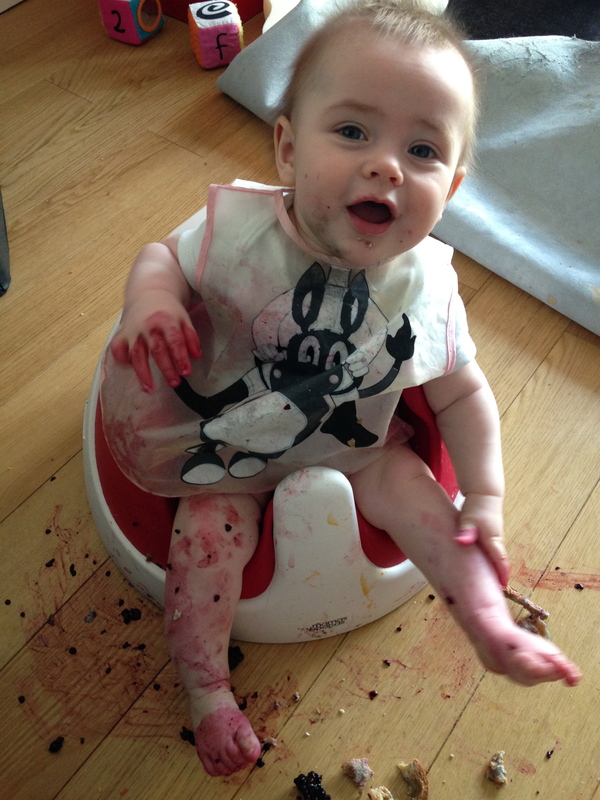 Not quite what I envisioned when I set out my Ultimate Weaning Strategy. I thought I had it all figured out. 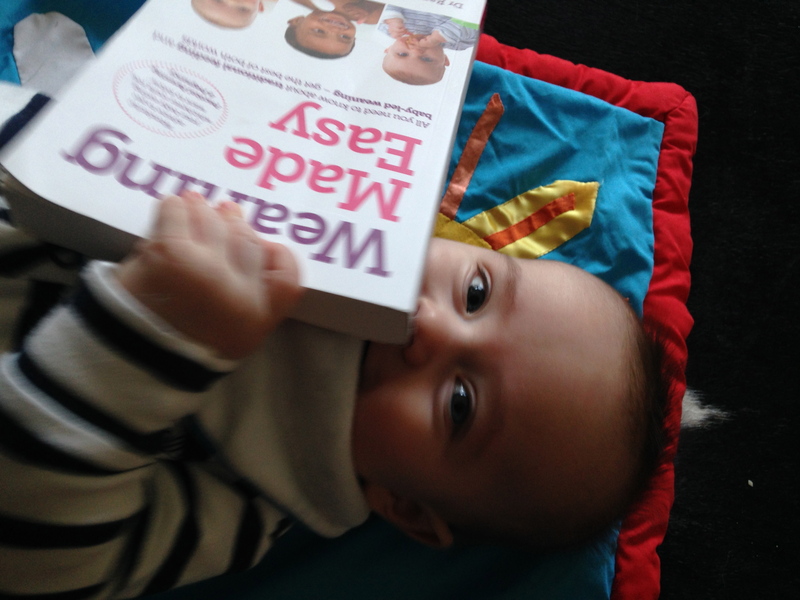 I had all the books, the recipes, all the baby led weaning tips. And almost a year on from Piglet’s “first tastes” (which were obviously the components of a full meal with all food groups, lovingly cut into baby-hand sized pieces for easy gripping, no spoons allowed) I have allowed myself to break the Golden Rule of Absolutely No Television At Mealtimes. And to think that some parents don’t allow their children to watch TV at all! All I can say to them (hats off to you) is LORD, HOW DO YOU COPE? Now, as regular readers may be aware, I am not one for enforcing rigid routines, much to the chagrin of my mother and occasionally other family members. However, one thing that I did insist upon as a “family rule,” starting from when Piglet had his first taste of solid food at six months (and it was six months, TO THE DAY. There was no way I was straying from NHS guidelines. I was going to be in that exclusive breastfeeding one per cent if it killed me), was that there would be no television watching during mealtimes. Oh no, we were to be one of those perfect families (albeit one with only two members, one of whom was sitting in a Bumbo seat at the time) who had civilised conversations at the dinner table, savoured their food and had table manners worthy of a trip to Buckingham Palace for a state banquet. Oh reader, how naive I was. The first “taste” of solid food. 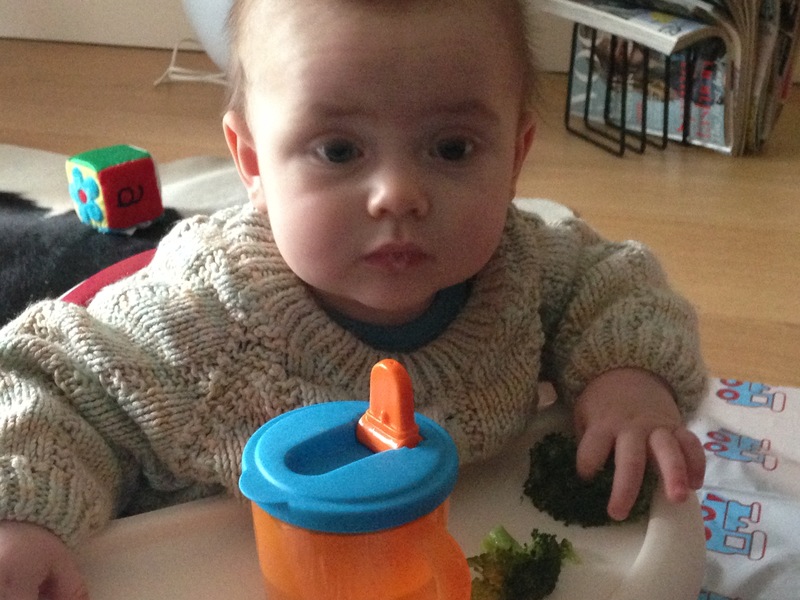 What is this green stuff Mummy, and why am I in this seat? 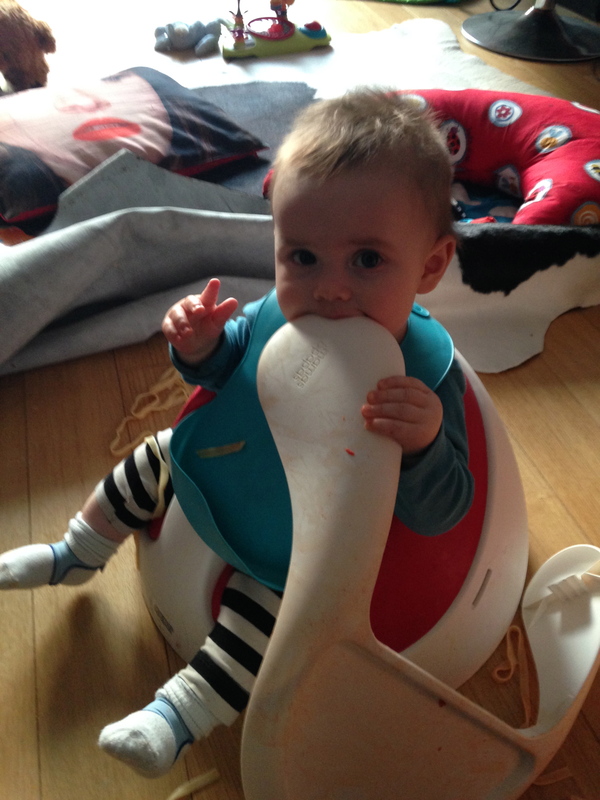 You said “weaning” was about eating, Mummy. Why bother with food when you can just eat the tray? Needless to say, mealtimes became fraught experiences which involved food throwing, Bumbo seat-wrecking, getting up and running away, refusing to eat and all manner of other unspeakables that would probably not be welcome at Buckingham Palace. Or even in Wagamama, where Piglet once almost took out a passing waitress with a carefully aimed piece of tofu. I started to feel marginally less judgemental of the family I had seen in Costa Coffee plonking a tablet of recurring episodes of Peppa Pig in front of their baby while she ate, and which had made me, in my innocence, almost pick up my feather and ink to write to the Daily Mail in disgust. And so, since I moved in with my mother (TEMPORARILY, I remind you. Piglet and I still intend to move out. ONE DAY) things have become more Royle Family as opposed to Royal Family. Every evening, without fail, Piglet is placed into his highchair and turned AWAY FROM THE TABLE, the hallowed table of family meals which I had been so keen to promote, and fed a steady diet of fish fingers and baked beans, whilst my mother and I feast on curry, risotto, or whatever other family meal the baby books say he should be joining in with, and that I had been keen to enforce, until I discovered that enforcing anything with Piglet was likely to lead to tears, stamping of feet and the point-blank refusal to eat anything other than blueberries for a week. The highchair is then strategically placed right in front of some combination of Waybaloo, Abney and Teal, The Clangers, Old Jack’s Boat, Katie Morag (and I appreciate that this is somewhat off-topic but WHY DOES SHE WEAR THE SAME CLOTHES EVERY DAY? Are there no clothes shops on that island? Are they in fact making their own clothes up there like it was 1750?) and In The Night Garden. That’s the same Night Garden where they drink nothing but pinky-ponk juice and eat what appears to be a diet consisting purely of jelly and hundreds and thousands. Like, cheers Pontipines, I’m going to tell Piglet that your 100% sugar diet stunted your growth and made you a hundred times smaller than everyone else, lest he thinks that it’s normal to go around eating whipped cream sundaes every day. Although, I have to hand it to you Mr and Mrs Pontipine, you have your children extremely well trained, getting them to carry that dinner table across some serious terrain for your many family picnics. I salute you, O Pontipines, with your family meals, for you have succeeded where I have failed. One thing I do forget is the weaning part! It can be so stressful, can’t it? Worrying about whether they’re eating enough. I felt under pressure that if I got it wrong then Piglet would end up obese, or eating nothing but crisps for the rest of his life! I know-I had all the books, all the plans…and in the end we just sort of muddled through it with a combination of trial and error. Piglet is partial to a fishfinger as well! It’s such a source of frustration isn’t it? They must know what they need though. That’s what I keep telling myself anyway! Love this! I remember those good intentions so well. They never work out. All those lovingly pureed vegetables and those carefully prepared and frozen fish pies and chicken casseroles were soon replaced with fish fingers, pizza and potato smiles. My kids are now 14, 12 and 9 and their diet still mainly consists of crap from the freezer, while I eat a ‘family meal’ of something proper on my own. That photo with all the mushed up blackberries on the legs?! OMG! Yes, I thought I had it nailed with my blackberries. I hadn’t been banking on something resembling a murder scene! Oh gosh, we go into parenthood with such good intentions don’t we and the realisation sets in. I used to childmind a boy who’s mum said “nope, no tv allowed for him at home” and he couldn’t wait for the days his dad picked him up first cos they’d go home and watch tv (and he’d tell me all about it the next day!). Aww bless! Yes, I think going to extremes either way is probably not the best way to go!